Budapest is blooming in April, the spring air is full of summer’s promises, and street events are returning, if the weather is fair. Here is our handpicked list for things to do in Budapest in April, but it only contains the yearly festivals and fairs. 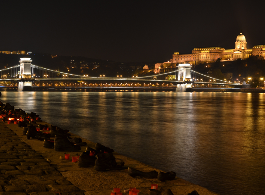 For the April current events, please take a look at our Top Budapest Event Calendar / Event Guide, or talk to locals, your private tour guide, the hotel receptionist, etc. Budapest Easter: Easter is celebrated in several places all over Budapest. There is and Easter festival, there are Easter fairs, Easter family activities, Easter menus, etc. As the weather is getting warmer, why not admire the riverside sights of Budapest on board of a guided Budapest Sightseeing Cruise? Have some drinks on a Cocktail Cruise or Wine Cruise, or if you fancy some more, select a Dinner Cruise on the Danube with buffet or served dinner and Live Music. April is perfect time to discover the historical places of the Buda Castle District, and see the beautiful panorama from the top of the Castle Hill. Should you wish to learn more about the most important attractions of this area, a Guided Buda Castle Tour is just for you. Discover the special National Days in the Great Market Hall in April, or book a guided Budapest Market Hall Tour with tastings of traditional Hungarian foods and drinks. A fun & unique way to view the city is on a Guided Budapest Segway Tour. There are some great parties to visit in April is Budapest. April Bath Parties in Budapest bring amazing laser shows and bath discos in Szechenyi Bath for late night pool parties. Just get your swimwear and enjoy the night in this visual / tactile and all in all fun and sensual place. 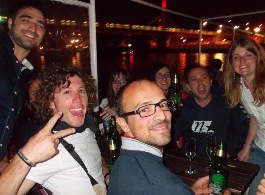 Booze Cruise & Boat Party: why not enjoy the beautiful sights of the illuminated Budapest while having a great party with international party goers, live DJ and drinks? Check out the Budapest Boat Party Cruises. Learn more about the Budapest April Festivals. Budapest Easter Fair: in the city centre, there is a nice square called Vorosmarty Square, which has become a top Christmas attraction in Europe. In recent years, this square has become the home of the spring fair too, known as the Budapest Easter Market with quality crafts made by Hungarian folk artisans, traditional Hungarian foods and drinks (you can try the Hungarian savoury snack (Langos), the simple and elegant Chimney Cake milk bread pastry (Kurtoskalacs), Hungarian sausages, ‘Hurka’ (something like the Scottish blood pudding), Easter hams and cakes, etc. Of course, there are several more smaller events at Easter, so our list is not exhaustive. Dates: Mar 29 – Apr 28, 2019. Cherry Blossom Festival (Ohanami / Sakura) in Budapest is in early – mid April in the botanical garden of the city in Fuveszkert (usually two weekends). The small scale Japanese festivities include concerts, exhibitions (calligraphy, origami, kokeshi dolls, etc. ), drinking Japanese tea, etc. You can try your hand at Kyudo, the traditional Japanese archery style. The Maido Japanese webshop goes offline and sells all kinds of Japanese items and gifts. Relaxed programme, off the bustling city centre of Budapest. Budapest Passover Festival is in the Jewish Quarter of Budapest (the quarters are in downtown Budapest in District 6 and 7, hence the name of the Jewish festival). Quarter 6 Quarter 7 Festival had various dates in the last few years, it was both in April and in Dec (2x in 2012), with various festivities from candle lighting through theatre performances and film screenings to Jewish culinary events, kosher foods and nice concerts. There will be guided Jewish walking tours during the festival where you can get some deeper insight into the (Hungarian) Jewish culture, the cultural heritage so lively vibrant in present day Budapest (there are dozens of venues, including quirky ruin pubs (romkocsma), clubs, restaurants, etc. Budapest Dance Festival is a 6-7 day programme, usually at the end of April, as the festival is connected to the International Day of Dance. There is no single venue of the April Dance Festival, but the major venues are the National Dance Theatre in the Buda Castle and the Festival Theatre in the Palace of Arts. The festival performances include various dance forms and traditions, often mixed with modern technology: ballet, contemporary dance, folk or folk inspired dance shows (like world music fusion in music) are in the programme list. Green park, nice crafts, foods, occasional concerts and children’s activities. Buy and try the fine products of Hungarian applied artists. After the bad weather and cold months, WAMP Design Fair moves out of its winter cave in Millenaris Park headquarters to sell the handmade crafts of Hungarian designers in the pleasant downtown square of Budapest. Budapest Half Marathon is held in April in Budapest. It is a runners’ must do sports event, and must be one of the most scenic marathons in the world. There are more and more participants at the spring half marathon. Besides the 21 km, you can choose from the 10 km and the 7 km distance. In 2013, there were 15,600 runners racing on the biggest spring sport event of Hungary, and out of them 3,800 ran the Half Marathon distance. Top Budapest Event Calendar / Event Guide to the current April events in Budapest, Hungary: click to see the currently highlighted events in Budapest in April this year. Get some more ideas about April things to do in Budapest from Festival Budapest, which has a thematic and fresh April Festivals Budapest list of outstanding festivals in the city.